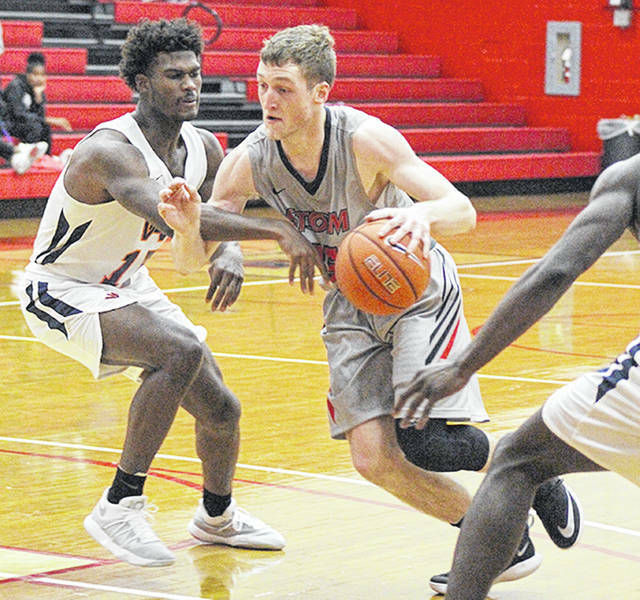 Rio Grande’s Cameron Schreiter scored a career-high 22 points to lead the RedStorm past Washington Adventist University, 65-62, in Saturday’s final round of the Bevo Francis Classic at the Newt Oliver Arena. RIO GRANDE, Ohio — Cameron Schreiter drilled a go-ahead three-pointer with 25 seconds to play and then came up with a victory-clinching steal in the closing seconds, leading the University of Rio Grande to a 65-62 win over Washington Adventist University, Saturday evening, in the final round of the Bevo Francis Classic at the Newt Oliver Arena. The RedStorm improved to 2-4 with the victory, snapping a two-game losing slide in the process. Washington Adventist, which also dropped a three-point decision to West Virginia University-Tech in Friday’s opening round, dropped to 1-3 with the loss. The Shock led 62-61 after Therence Mayimba connected on one of two free throw attempts with 56.2 seconds remaining to play, but Schreiter – a junior from Mason, Ohio – delivered an answered prayer by burying a 30-foot three-pointer as the shot clock expired to give the RedStorm a 64-62 edge with 25 seconds remaining. Rio came up with a defensive stop on WAU’s ensuing possession and freshman Gunner Short (Catlettsburg, KY) subsequently hit one of two free throw tries with 2.9 seconds left to extend the lead to 65-62. Still, it took a steal at midcourt by Schreiter on the Shock’s last-gasp inbounds play to seal the victory and end a see-saw affair which produced seven ties and 11 lead changes. Schreiter, who had a career-high 16 rebounds in Friday night’s loss to Bluefield (Va.) College, finished with a career-high 22 points to lead a quartet of double-digit scorers for the RedStorm. Short finished with 14 points, while junior Hadith Tiggs (Mayfield Heights, OH) had 13 points to go along with a team-high eight rebounds, six assists and three steals. Senior Earl Russell (Warrington, England) added 11 points and a trio of blocked shots for Rio, which led by seven points with 15:36 remaining before trailing by just as many with 9:00 left in the contest. Mayimba led Washington Adventist with 14 points, eight rebounds and three blocks, while Derek Hopkins and Xavier Sewell added 13 and 11 points, respectively, in a losing cause for the Shock. Rio Grande returns to action next Saturday against Robert Morris (Ill.) University in the opening round of the NAIA DII Showcase at the MeadowView Marriott Conference Resort and Convention Center in Kingsport, Tenn.
Tipoff is set for 11 a.m.